Our dental office has several solutions to replace failing teeth or lost teeth. Learn more about our teeth replacement options and find out why "Dental Implants" have become the gold standard for restoring teeth. Dr. Takeuchi offers dental services to all ages, your whole family is more than welcome. We hope to become your trusted one-stop provider for the full range of cosmetic and family dentistry. 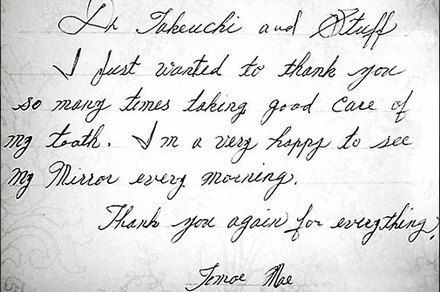 Dr. Takeuchi and the dental staff wants you to know that you are more than our dental patient, you are our guest. We provide various dental services that will allow you to feel comfortable and relaxed during your dental visit. Including pain free, anxiety free sedation and In-ceiling DirectTV. If you have a great deal of anxiety about going to the dentist, you've come to the right place. Dr. Takeuchi can fix your teeth, restore gums, and brighten your smile without discomfort. With conscious sedation, you'll be able to relax through your appointments. At home, there are a few simple things to do to maintain good oral hygiene. During checkups, we'll provide a thorough exam and cleaning. Doug Takeuchi, D.D.S. takes tremendous pride in being able to provide COMFORTABLE services to our patients by using high-tech equipment combined with sedation options for those truly nervous patients. Restoring your smile is easier than ever in our office! Doug Takeuchi, D.D.S. excels at restoring full function to your smile. Dr. Takeuchi offers affordable temporary and permanent tooth replacement options fitted with little to no discomfort! Dentures are no longer the only way to replace teeth. implants now offer the best lifelong tooth replacement solution. We love being able to change patients lives by giving them confidence with a radiant smile! Cosmetic dentistry has come a long way and today it is very affordable thanks to advances in both technology and techniques. Doug Takeuchi, D.D.S. takes tremendous pride in being able to restore your chipped, cracked, or otherwise damaged teeth. From tooth colored fillings to root canals, the office of Doug Takeuchi, D.D.S. is able to restore your smile back to its natural look and feel. Teaching your child healthy habits from the start will help them maintain a bright healthy smile for the rest of their life. Doug Takeuchi, D.D.S. enjoys taking care of children's teeth and we are here to make you and your child as comfortable as possible. Dr. Takeuchi takes great pride in being able to provide each and every patient with services to achieve their individual needs and goals. We want our patients to understand that their oral health and personal well-being come first. Because of this, our office offers flexible payment solutions as well as CareCredit that make it as easy as possible for you to afford the procedures not covered by your insurance. Most patients are amazed just how affordable a new smile can be! We have the experience necessary to maximize your insurance utilization; however, please, do not let any lack of insurance benefits determine your desired or necessary treatment. CareCredit financing is more affordable than you may think. Untreated dental problems can quickly become more painful and expensive to repair, it’s best to handle them promptly. Call the dental office of Dr. Takeuchi at 408-295-5651, we will work with your insurance provider and do our best to maximize your dental insurance coverage.